We’ve all “sinned, and come short of the glory of God” (Rom. 3:23, KJV). We know this, and repenting of those sins in our pasts and accepting Jesus as our savior to wash them away was a first step in becoming Christian. Even after conversion, though, we’re not perfect. God keeps forgiving us when we repent, but we still fall short of perfect obedience. I think it’s also fair to say all or most of us have struggled with some sins more than others. I’m sure we can all think of someone else like this. Someone who you’d think has been in the church long enough to “get over” their bitterness, or lust, or covetousness, or whatever the particular problem is. But if we think about it, many of us are in the same boat. We’re often more understanding toward our own struggles, but we still have them. Or perhaps we’re even harder on ourselves than we are on others. So what do we do? How do we deal with our own sin struggles and react to those around us when they come short of God’s commands? The problem with the first is we have to face our struggles and talk about them with God, at the very least. You can’t overcome something you’re ignoring. With the second, the problem is that people who are openly and willfully sinning can’t be allowed to stay in the church (1 Corinthians 5). If you’re going to follow Christ, you have to stop practicing immorality. In both cases, the only reaction that can solve the problem is turning to God in repentance and calling on the name Jesus Christ. “Repent therefore and be converted, that your sins may be blotted out, so that times of refreshing may come from the presence of the Lord” (Acts 3:19). That’s the only answer. But as any Christian knows, turning to Jesus doesn’t instantly cure you of sinful desires. We still do and say and desire things that don’t line-up even with the simplest commands: Love God with all you are and love your neighbor as yourself. So what do we do when the desire to sin just won’t go away? How do we do battle against an enemy firmly entrenched in our mind and emotions? First, we cry out to Jesus. 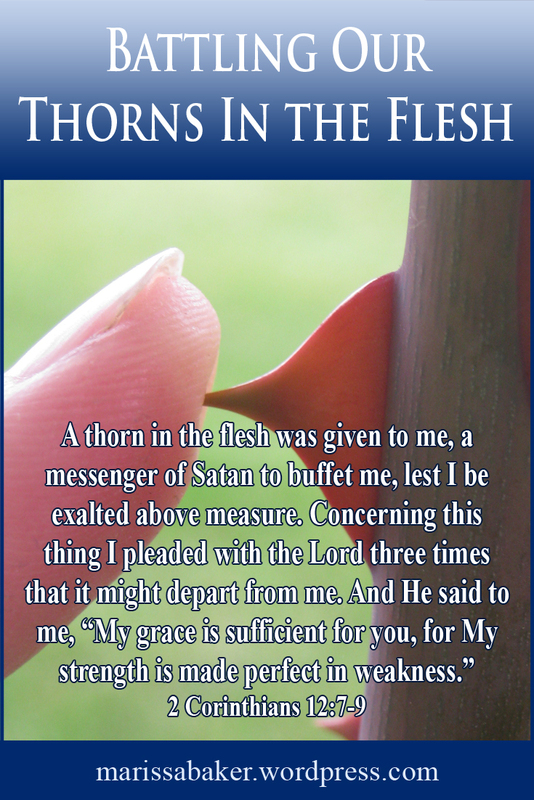 We’re not told what Paul’s thorn was. It might not even have been a struggle against a particular sin (I’ve heard speculation ranging from a medical condition to struggles with lust). I think it’s purposefully vague so that each of us can identify what he’s going through with our own specific struggles. Note that the first thing Paul did was take this problem to Jesus. He knew “the Lord knows how to deliver the godly out of temptations” (2 Pet. 2:9). And sometimes that’s what God does, either immediately or eventually. But sometimes the answer isn’t freedom from the trial. Sometimes, the answer is help within your struggle. Earlier this year, I had a panic attack going into a weekend-long social event. Trying to get through that made me turn to God in near-continuous prayer and I experienced what Paul is talking about here. The anxiety was still there nagging at my nerves and mind, but the sense of my Lord’s presence was even stronger. That doesn’t mean I haven’t struggled with anxiety since then, though. It just means I know He’s there to help when I ask Him and trust Him. It can be the same way with things like bitterness or lust or other sins. Sometimes God doesn’t take the temptation away. But He is faithful and “will not allow you to be tempted beyond what you are able, but with the temptation will also make the way of escape, that you may be able to bear it” (1 Cor. 1013). This begs the question, “Do sins have to involve an action, or can thoughts and desires be sins as well?” We shouldn’t approach this question from a “How far can I go before it’s sin?” perspective. When we get to that point, I don’t think we’re obeying in the spirit of the Law, as it talks about in Romans. We’re trying to skirt as close as possible to the letter of the law and that’s not the sort of attitude God looks for. Rather, I’m trying to answer the question, “Is having a tendency to struggle with a certain sin in and of itself sinful?” I lean toward answering “no,” otherwise simply having a thorn of this sort would be a sin in itself and there’s no indication of that in Paul’s discussion. But sin does begin in the heart. In Israel under the Old Covenant, you couldn’t be punished for breaking a law unless you went through with the associated unlawful action. But the law under the New Covenant is written in our hearts (Heb. 8:10) and we’re to obey God in our spirits as well as our actions. Let’s use lust as an example. Jesus said, “You have heard that it was said to those of old, ‘You shall not commit adultery.’ But I say to you that whoever looks at a woman to lust for her has already committed adultery with her in his heart” (Matt. 5:27-28). This isn’t just glancing at someone and thinking they’re hot. In other words, if you really, really want to sin but don’t go through with the act, you’ll still answer to God for indulging that desire. But if a thought that could lead to sin pops in your head and you reject it? That’s not a sin. 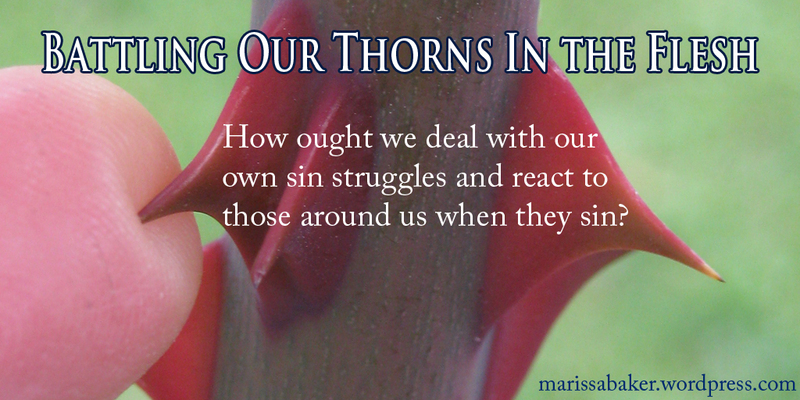 That’s battling your thorns with the power of Jesus Christ. That’s the goal. If the strongholds we face haven’t yet been pulled down and our thoughts aren’t all in captivity to obeying Christ, it’s not the end. We know He’s still there fighting alongside us. And we need to remember that’s the case with our brethren as well. You can’t judge where someone else is in their spiritual warfare. They answer to God alone, just as you and I do, for what they’re doing with what He has given them (Rom. 14:4). “Stand fast in the Lord, my dearly beloved” (Phil. 4:1, KJV). I don’t know exactly what all of you are battling, but I know with the help of Jesus you can win. God is able to make you stand and He’s ready to forgive us as many times as we turn back to Him and ask. I pray the Lord blesses you and lets you feel His presence right there helping you through whatever your struggles are. This is golden! Thank you so much for continuing to teach us. This lesson is so timely. I have been struggling with forgiveness. The temptation to hang onto the pain is incredible. I so appreciate how you have faithfully been digging in and sharing so much that God has for us to learn and implement. I have found insurmountable value in most all the blogs you post!! So grateful for your walk with our Messiah!!! Thank you so much for your encouraging comment 🙂 Forgiveness can be so hard. I often find that even after I thought I forgave and let go of the pain, there’s still anger at the person lurking in my heart. I pray God continues to help you in this battle!